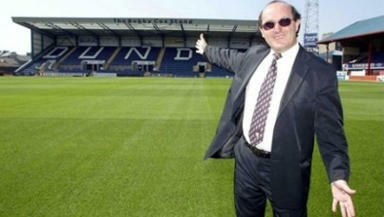 Giovanni di Stefano had a brief but colourful spell on the board at Dens Park eight years ago before the club went into administration. A controversial lawyer and former Dundee FC director accused of defrauding clients out of £140,000 will not stand trial until 2013. Giovanni di Stefano, 56, earned his nickname the 'Devil's advocate' after representing a series of notorious criminals including Great Train Robber Ronnie Biggs, Britain's most prolific serial killer Harold Shipman, alleged war criminal Slobodan Milosevic and disgraced rocker Gary Glitter. He also advised the team that defended Saddam Hussein. Di Stefano appeared at Southwark Crown Court on Thursday to deny ten counts of obtaining money transfers by deception, one count of attempting to obtain a money transfer by deception and one count of theft. He also pled not guilty to three counts of acquiring criminal property, one count of using criminal property and two counts of fraud. All the offences are alleged to have been committed between June 2004 and June 2009. According to court documents, Di Stefano defrauded Paula Gregory-Dade out of £120,000 by claiming he was a qualified Italian lawyer between June and November 2004. He lasted six months as a director at Dens Park from August 2003 to January 2004, before he left after the club went into administration. As Dundee again faced financial difficulties late last year, di Stefano told STV he would have “no problem” taking over the club, so long as he had “dictatorial command” of the Dark Blues. His statement of interest in the club did not go any further. He is also charged with pocketing £10,000 from Christine Smith to represent her husband Michael at a sentencing hearing in December 2005 and during his subsequent appeal against conviction. Di Stefano is said to have attempted to pocket €10,000 from Laurent Penchef in the same way. Prosecutors allege the Italian also stole a convertible BMW 325i from BMW Financial Services and dishonestly acquired £83,000. It is also claimed he had access to criminal proceeds of more than £70,000 in a Lloyds TSB account. Di Stefano is accused of abusing his position as a legal advisor to Stafford William Gillies Freeborn and Alberto and Linda Sgoluppi. He was arrested in February of this year in Spain as a result of a European Arrest Warrant. The lawyer is expected to stand trial on January 14, 2013. Judge Alistair McCreath remanded Di Stefano, of North Stream, Marchside, Canterbury, in Kent, on bail ahead of his next appearance for a directions hearing in January 2012.